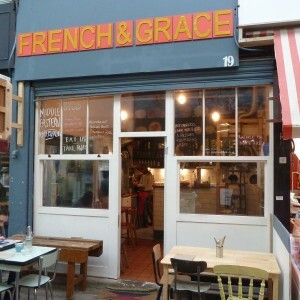 French and Grace is a duo who used to run a supper club and now run a small restaurant in Brixton Village serving wraps. And when we say small we mean small – there are only three tables inside which have the maximum number of seats with many stools, so you feel a bit like a sardine. There are tables outside in the arcade but even during the day these are only for the hardy in the cold months. The smallness doesn’t make this restaurant cosy. When we visited on a Friday lunchtime it was full inside and we sat in a corner table squeezing in beside the coats. Water arrived very quickly but after we had given our order it was very difficult to attract anyone’s attention – even to get a napkin – this is despite the cramped nature of the place where you can almost touch all walls at the same time. The cuisine has a middle eastern feel to it. Mezze of hummus (their spelling) made of butter beans and rosemary, baba ghanoush (an aubergine pate) salted labneh (a kind of cheese) and tabbouleh. There are also wraps including “uber wraps” of flatbread lamb merguez and chargrilled halloumi and these were clearly popular as several people came for takeaways in the short time we were there. There were also “specials” and on the day we visited it was lamb meatballs in a spicy pumpkin soup. So we ordered the small mezze and the lamb meatballs. The soupy meatballs was not really soupy at all – it was more like a thick slightly sweet sauce. It was also piping hot – so hot I decided to pour some of my water into it which made it much more pleaasant in temperature and much more like a soup. It allowed me to taste the meatballs which were a good consistency but perhaps in the hot soup lost a little of their flavour. The mezze was pleasant but tabbouleh in the middle east is usually very green whereas this was beige so it really did need more parsley and mint. Neither the hummus or salted labneh were interesting enough but the baba ghanoush was as good as we have eaten in Damascus. They do not have a licence yet so they charge £1 for corkage per person. But they do have soft drinks, tea and complimentary cold water. The service on a slow lunchtime was inattentive – in fact we were astonished how hard it was to attract attention. But we have watched the restaurant on a Saturday night and we have seen better attention than we received. Price per person is about £8 per person which is reasonable.